← I’ve Been Recruited for Leap Day! My husband bought me an iPad for my birthday. I didn’t think it was going to be a big deal. I mean, I already had an iPhone. How different can this be? I wondered. I immediately fell in love with it. Suddenly, I could read blogs, read books, get email and play Words With Friends — without my glasses. I am kind of lax when it comes to taking care of my toys. When Hubby gave me the iPad, he made me promise I would get a good protective cover. My friend, Michael Hess, Founder and C.E.O. of Skooba Design told me he would give me an iPad cover; I just had to visit his warehouse. A few months passed, and I finally got my act together and went to Skooba which is about eleventy-bajillion miles from my house. If you have an iPad, I’m guessing you love it and you know that you’ve got to protect that sucker. But in case you just got one or you are planning to get one for yourself or someone you love, here is the chance to win the best iPad cover in the world. Because everything at Skooba is fabulous. The one I use is the tablet sized neo-skin with handles shown in the picture below. Click on the picture to see more about this bag’s features. 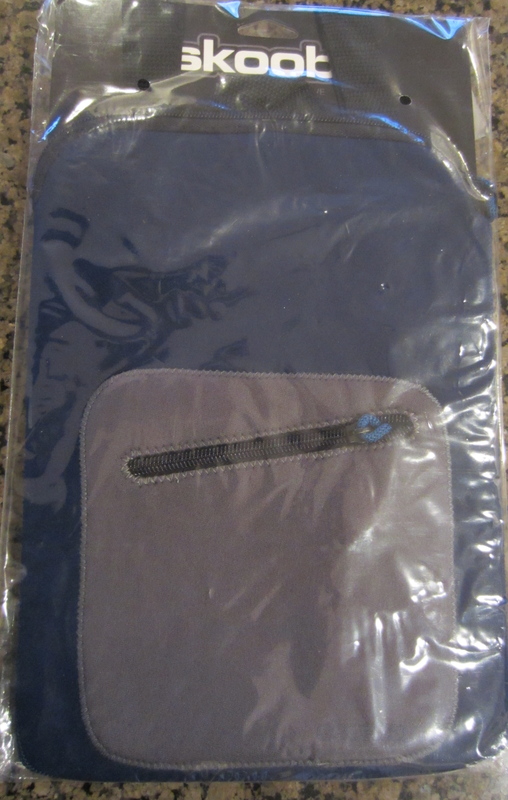 The one I’m giving away on March 8, 2012 is a navy blue sheath with a gray pocket. You can store all the cables in the zippered pocket. In addition to being the head honcho at Skooba, Michael is an amazing public speaker. He has visited my classroom as a guest lecturer to talk to my students, and I can tell you they appreciate the way he explains the importance of possessing solid communication skills in today’s competitive job market. He’s much bigger in real life. IYKWIM. 1. Read Michael’s blog post and leave a comment here. Tell me something about his piece that interested you. Or you found funny. Or irritating. (I’m guessing Michael will be reading along, too.) Do this before March 7, 2012 at 6 PM EST and receive 1 vote. 2. LIKE my Facebook page and get 1 vote. If you have already LIKED my page, remind me in your comment. 3. Share this story on Twitter, and I will give you 2 additional chances to win. Feel free to copy and paste the following text: I just entered to win a free iPad cover from @Skooba via @rasjacobson — and include the link. If you do this properly, I will see it on Twitter. I will make a big ole Excel spread sheet, and then Random Number Generator will do all the work for me. I’ll announce the winner on March 8, 2012. If the winner doesn’t contact me to claim the prize within 48 hours of being selected, a new winner will be chosen. Oh, and if you would like to order something else from Skooba, Michael has been kind enough to extend the promotional code TWITS20 to my readers so you can receive 20% off any order of $50 or more (plus free shipping via UPS in 48 states) through the end of March. I told you March came in like a lion. Skooba provided me with two iPad covers for this promotion. I am keeping one. The opinions expressed here are my own. This entry was posted in When Life Doesn't Fit in a File Folder and tagged Giveaway, iPad, iPad protector, Michael Hess, Skooba Designs. Bookmark the permalink. I’m not entering the contest, but what Michael says holds so much truth, especially the part apart about the misuse of apostrophes in plurals. When did that start? I can understand people mixing up homophones, but nowhere in one’s education did we ever learn that apostrophes had anything to do with plurals except as plural possessives. But the folks who use apostrophes as plurals don’t use them with plurals. I don’t understand it. It boggles the mind. The “couple things” struck a chord, too. I can make little mistakes here and there, but I try to be careful. It does irk me when someone types ‘loose’ for ‘lose’. Or confuses ‘there’, ‘they’re’ and ‘their’. Hi Darla: As an English Prof, I try to remain calm when I see these types of errors, but I do twitch a little when I catch them. Don’t need a cover, already have one. Wayne: If you aren’t going to play my rainbow game, I have a tech question for you. Why does my avatar work on some blogs but not others? For example, if I try to post on Tyler Tarver’s blog, no go. Also (to add more confusion), if I am commenting from my phone, my icon usually works, but if I’m writing from my iPad, it NEVER works. Ever. I’m always a square shape. To keep the same profile pic everywhere you’ve got to have accounts on all the services you can find. This is a PITA. If you want your pic to show up everywhere you’ll have to do it though. Check the sites where your pic isn’t showing up, and find out what Profile scheme they are using. You’ve got your blog set to WordPress, Twitter, and Facebook. As you may have noticed I come in using my own site for my Profile, but since I’m running WordPress, your WordPress install queries my site, then queries WordPress, and pulls up my picture. It isn’t complicated. Think of it rather as sending your bank, workplace, etc. an updated address when you move. I’m not entering to win, although I’ll probably share you all over the place anyway. Loved the article. I cannot stand the misuse of our lovely English language in writing. I’m a snob, I know, but I kind of do have a little judgmental streak in me when I’m reading something “professional” that misuses their, there, they’re, or it’s, its. I have words that I have to think about every single time I type them, but I take the time to think about them and get them write (haha…just kidding). Loose vs lose, choose vs chose, where vs were. I’ve just set myself up for some blog corrections, haven’t I? I’m a grammar snob, too. As a teacher, I have to smile through the pain. Because these are the mistakes my students make all the time. Their vs. there drives me nuts! I do not own an iPad, but I do play Words With Friends!!! 😀 I am off to find you and request a duel. I don’t need an iPad cover because I don’t own an iPad yet. Oh well… I’ll still like the post! Now, when you decide to give away a set of guitar strings or a 50 lb bag of goat feed… then I’m all in!!! I’m pretty sure I could get some goat feed for the Naughty from the farmer just around the way. Shipping would be a bear. The cover also would hold a Kindle or similar electronic gadget. I guess I should have said that, huh? I don’t have an iPad, and when my brother bought me my first iPod for my birthday, many years go, Baka ate it!. I guess I could have used a cover. I’m pretty sure hearing “Irregardless” one too many times turned my hair gray. With all due respect…I don’t respect you. I hear what you’re saying…but I wasn’t listening. Heh hehe heh. You funny lady! They’re is sew much I wont too no about ewe. I too love my iPad! 1) when people mix up days and dates (for example, Friday March 1st instead of Thursday March 1st). Can’t people look at a calendar? I think people who use text language in business are doojies. yikes, I’m guilty of using “comprised of”! 😦 But yes, I’ve heard those quite often (though irregardless sure sounds awkward!) I’m kind of a grammar freak myself so that bothers me too. Well played. And entered into my Excel spread sheet! Wow Janice. You are in it to win it! Some of these grammar crimes irritate me, while some others don’t bother me a bit. I don’t think there is an objective criteria to distinguish between the two.